Share unique moments with your loved ones! The astonishing location of Petani Bay Hotel with its romantic environment will give to your reception a unique touch of luxury and warmth.The personnel of Petani Bay Hotel along with our associates will contribute with their experience to the perfect carrying out of your reception. The hotel offers you and your guests an aperitif at your reception! If you are holding a wedding reception the management of our hotel offers the newly weds, along with its best wishes, a complimentary suite for their wedding night at a very special price, a champange and the wonderful breakfast of the next day. The reception hall will be furnished with the appropriate tablecloths and individual client napkins. The reception Coordinator is at your disposal in case you need advice and ideas regarding decor combinations, the hall planning and the placement of tables. The compositions of your choice are always welcome. The entertainment part is one of the most important parts of your reception planning.The choice of the orchestra and dj is yours. Plan with us all the details that will give to your reception your personal touch. Our associates and their staff prepare wonderful dishes with unique flavor varieties of greek and Mediterranean gastronomy. You can choose among menu, buffet or cocktail. 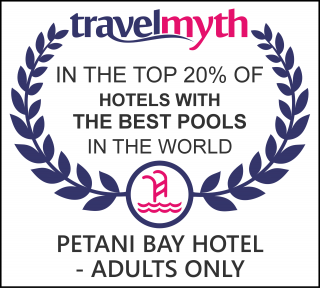 Petani Bay Hotel can host all your social engagements with care, warmth and respect. 3. Anniversaries, Birthdays, Wedding proposals, etc for couples. A massage overlooking the bay and the sunset during evening (upon availability). A special private dinner with candle lights. Bottle of champagne, a local bottle of wine or a bottle of Proseco. Flowers upon arrival in your suite or during dinner. “Whatever your desire, we make it happen”. 4. A Special reunion (from 10 to 50 people) celebrating a name’s day, anniversary, birthdays, bachelor party or just a meeting with friends and associates. Special big jar (over 3.1 lt) of our cocktail. A variety of grilled meat on a platter or in an open buffet style near the pool, with pita bread and garnish with a variety of salads and appetizers on your request. Anything you might suggest and satisfies your needs.